Wow. How many Bricklink orders did it take, or is it just from existing sets? I love the feel of a titanic skeletal MOC. Amazing. It's cool how it shows the thing forming from the piles of balljoints. A 'fully-formed' armored version would be cool too though. Seriously. Could you do Heroes of Olympus MOCs? Also: love the K-10 and the Reeka!! Don't ever stop MOCing!! I agree with the 2 last sentences of the last comment.But,Awsome MOC! Oh, Chronos, I think a fully armored version could be cool, but I think the creature is original because it is not armored! Is just fully skeleton... and that's really, REALLY, cool. Jang, I think i won't sleep tonight... Thanks about ALL your MOCs. I love it!! I really want some Heroes of Olympus!! Please!! @Anonymous (6th comment)- Ya know eBay, right? Yeah, well, Bricklink is like that- the site doesn't sell stuff, it hosts people's stores. I know what you mean about the way the MOC is unarmored, that is why I love it. I'm just saying that with something of this scale, it would be awesome to see a full version. Maybe another MOC, another time, eh JANG? Also a bipedal one would be so cool, but probably couldn't stand without supports or a walking stck or something. Oh, and will we ever see Zeyek as a MOC? Most EPIC MOC I have seen in my life! 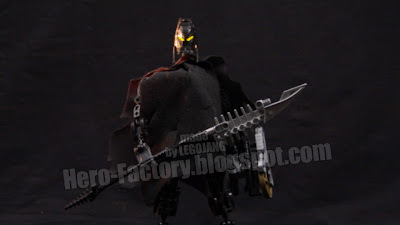 And I'd imagine that Zeyek isn't too complex in design as JANG probably wants to use his detailed Technicky parts for other MOCs, and nobody will notice if Zeyek is really simple due to his voluminous black cloak. Zeyek is a 100% custom scratchbuilt design that took no inspiration from any existing thing I've previously seen. Same goes for his ship. If you look back through earlier Zeyek posts on his original site, you'll notice that he actually has two completely different forms. But now that you've told us that please post him (at least on the Bionicle MOCs Blog)! Or at least show us him without hus cale so that we can see his design. Did you design and build him with an intent to post him, and never did? I love that skeleton creature, really amazing. Well, the only thing I can say is: Zeyek is COOL, his spaceship-time machine-flying car-magic schoolbus (wait, what the hell...?! xD), or whatever is also very COOL. And the Remainder... simply ROCKS. But... tell me JANG; Zeyek is just a Chronicler, the oldest living one (but not the LONGEST living, not? xD), and he is not a warrior or a fighter. Why can he approach to all this terrible creatures without they get angry, and have to fight against them to save him? Well Zeyk does have a Kanoka launcher and an epic spear thing... Maybe he doesn't need to fight up close and personal if he shoots Kanoka and energy blasts (from his spear?). Or maybe he is an extremely old Toa or something. I'd say he could be a Great Being- but I seem to remember him saying something along the lines of "why the Great Beings do this is a mystery" so probably not. Unless the hidden GB is actually Zeyek! (Just kidding) Orde would be so surprised. :D Anyone who reads Greg Farshtey's Bionicle serials will know what I mean. @thejang I can't really make out what the second form is. According to what I see, Zeyek's other form looks kinda shorter and hunchbacked. I don't think he's a Great Being, because the GBs actually create Spherus Magna and all these kind of things, and Zeyek travels all around these planets, "seekin' out adventures, documenting events..." If he's actually a GB, he's got a little bit of alzheimer, because he's exploring the universe that he and the other GBs created, but he didn't remembers he's a Great Being. Where do you find Zeyek's other form? No. Zeyek can't be a GB. I know he isn't, it was a joke. I personally think it's Velika. Velika is a Po-Matoran from Voya Nui. I was talking about how supposedly, one of the Great Beings has been disguising themselves as someone from the Matoran Universe. I jokingly said if was Zeyek. However, my true theory is that it is Velika. All of that probably made no sense if you aren't familiar with Bionicle. No, now I know what you mean... in fact, about one or two years ago, I discovered Bionicle Wiki... I didn't know that Bionicle comics exist! LOL. Bioniclesector01 is the largest database of BIONICLE information on the net. However, Lanzadora's name is not on Heroesector01. Lanzadora looks like Surge with the blue and all that. I can prove his name is Lanzadora. Nave Lanzadora to be exact. Hey, I'm from Spain, and I think when you want to say Lanzadora, you mean Lanzadera. I don't know exactly mean with this comment... are you talking about the Drop Ship? @ Anonymous "Nave Lanzadora": Sheesh, how many times do I have to tell you people? HIS NAME IS NOT NAVE LANZADORA! And plus, if he weren’t a MINOR CHARACTER who IS NOT INCLUDED IN THE HERO FACTORY CANON, his name would be on the HF website and HS01. There’s proof that that isn’t his name. Nave Lanzadora IS his real name. It says on the side of the box. Nave is a real name. He was'nt in any of the TV eps, but Drop Ship was. Vapour is not in the TV series. Do not make me change the subject to Vapour's name. So do not say how many times do i have to tell "you people" when the 27th comment was made by you XTN when that was the only comment you posted on the blogpost on the Lanzadora subject. For the love of god, no more flamewars. Please, guys. Nave Lanzadora would appear to be his real name. Maybe he was supposed to be a character but was then removed from the canon. Maybe it's a similar scenario with Vapour. Who case what it translates to? Did you know that all of the names- of everything- in the first few years of Bionicle were all Maori words? Yeah. Pohatu means 'rock'. Kanohi means 'mask'. Nave Lanzadora roughly means 'Naval Launcher'. And I ask you this: does it really matter? You guys can call him Nave Lanzadora all you want, but I'm sticking with the fanmade name I gave him. Yes, I do know that all of Bionicle's first characters had Maori names, because I have been collecting since 2001 and I do remember the lawsuit against Lego. Now, I just want to apologize to Jang for making an irrelevant comment when I should have been posting about The Remainder. Anyway... why somebody started to talk about the Drop Ship (are you talking about it, right? ), and to put links on the page, and to say Nave Lanzadora...? How happened with this comment? What does he mean? Also, in fact, "kanohi", in the Maori language, means "face", not "mask", and "toa" means "champion"... but since this, LEGO has been very careful about the names of their stuff. I just wanted to keep it clear. XTN-That's okay. :) I hear ya. I actually didn't know about the Maori lawsuit thing until recently... I didn't start collecting Bionicles until I got Turahk in 2003 purely for the reason that he looked cool (I was like five :D), and I didn't really start collecting them until 2004. Back on topic. Will Zeyek have any tales about the Remainder for us anytime soon? My first bionicle was Chirox. The bat like Makuta in Kardi Nui. I got him in 2009 for Christmas. I gained an interest to Bionicle after my brother got Berix, Atakus, Zesk and Tarduk for his birthday. My latest Bionicle set is 2003 Matoro and Rahaga Iruni.